Accessed by clicking the preferences shortcut icon. The dialog is also accessed from the Edit->Preferences menu item. 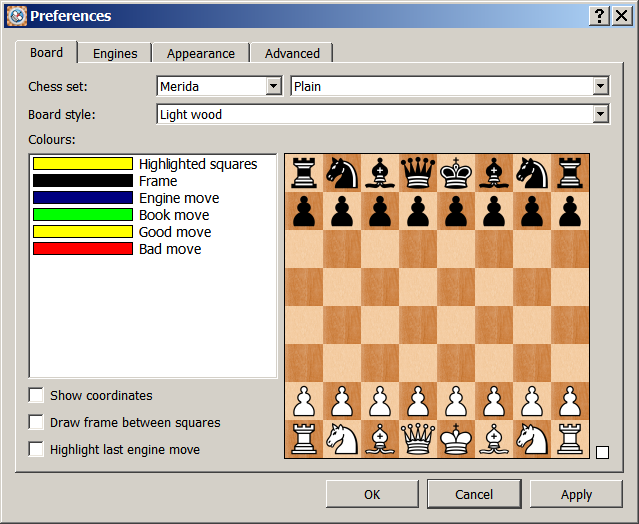 Board configuration tab allows configuration of the chess board and chess set presentation, and engine/coach highlights. Engines configuration tab allows configuration of the chess engines used and common data they use. Appearance configuration tab allows configuration of the general appearance of the user interface. Advanced configuration tab allows configuration of miscellaneous settings. When the preferences are configured the settings remain set each time you run the program until you next change them. Clicking the Apply button will apply the current settings but keeps the dialog open. Clicking the Cancel button will cancel any changes since the last apply and exit the dialog. Finally click the OK button to apply the current settings and exit the dialog back to the main display. Copyright © 2012-2014 by Applied Computer Concepts Ltd. All Rights Reserved.